Impact wrenches are found in the toolboxes of mechanics everywhere. The chances are that if you do work in the automotive industry, you either have one or are in the market for one. With the technological advancements that have been made, the market is saturated with options! There are so many models to choose from that it may be hard to pick. Which is the best cordless impact wrench for automotive use? Take a look at this list to see which one may best suit your needs! DeWalt wrenches are popular and with good reason. The company has stood the test of time, and their wrenches are widely available across the country. This model, in particular, has many features that set it apart from the rest! It features a brushless motor which makes this model a prime choice for those who need mobility and flexibility. The brushless motor also adds points in the durability department! Because brushless motors have less internal parts, they are not as likely to be damaged in the event of a fall or drop. The three built-in speed options allow for greater control when compared to earlier models, ensuring that you can pick the perfect speed and the correct amount of power for the task at hand. If you often work in low light environments then you’re in for a treat with the built-in LED light that this model features. The LED light increases safety when working in low light conditions and allows for more flexibility with which times of the day that you can get work finished. The only downside found with this model is the weight – some users have reported that at 7.2 lbs it is a bit heavy, but that’s merely a matter of personal preference and most users have reported that they’ve grown used to the weight over time. You really can’t go wrong with the DeWalt DCF899P2. Some may say that this is the best cordless impact wrench for automotive use! With this model’s compact design, low weight, and other great features this cordless impact wrench may be the way to go If you are working in tight spaces and mobility takes priority when it comes to your equipment. Like with most of the impact wrenches featured here, the Hitachi WR18DBDL2 features an on tool LED light. The light adds to the list of convenient features embedded within this model, packing even more of a punch into its compact size. Unlike the other cordless impact wrenches listed within this article, the Hitachi WR18DBDL2 features a belt hook which further emphasizes its portability! If you’re working for extended periods of time and find yourself getting easily fatigued than the light weight of this wrench will be a welcome change compared to the heavier impact wrenches of times past. In fact, this wrench boasts the lowest weight of all of the wrenches featured on this list. The Bosch IWMH182-01 is another wonderful option for those searching for a cordless impact wrench that is compact in size and optimized for portability. The LED light on this wrench gives the user assistance when working in the dark, tight areas that shop lights are often unable to reach. This model also features an anti-slip grip on the handle to give extra safety while handling. At 3.6 lbs it’s not quite as light as the Hitachi WR18DBDL2, but its weight is still on the light end which is great news for those who do not want to deal with a lot of weight. With its capacity to deliver up to 184ft-lbs of torque it is undoubtedly powerful, but it doesn’t boast nearly as much torque as the other models listed in the article, like the Dewalt DCF899P2 which delivers 700ft-lb. With that being said, is this the best cordless impact wrench for automotive use? No. However, if you are in the market for something medium¬duty and do work on large equipment this could be the perfect wrench for you! Here we have another excellent medium-duty cordless impact wrench. The Craftsman ID2030K is slightly more powerful than the Bosch IWMH182-01, with a maximum torque of 300ft-lb – making this wrench an excellent choice for those who primarily work on DIY projects while still being powerful enough for occasional professional use. The Craftsman ID2030K comes with an included battery – and a powerful one at that! The 4Ah XPC battery runs four times longer than the ni-cd batteries most often used in other cordless impact wrenches. 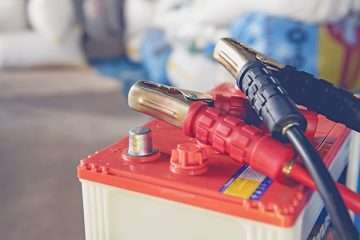 The included battery also boasts temperature protections and will remain functional and safe to use in conditions ranging from five degrees all of the way up to 158 degrees! This wrench only takes 1.5 hours to fully charge, making it great for those who need to work on the fly and for those who do a lot of work on short notice. This model also features a micro-textured handling grip to enhance comfort when handling making this an excellent choice for those who often experience fatigue in their hands while working. The Milwaukee 2763-22 is intuitive to use, durable, and extremely powerful! With a maximum torque of 700ft-lb, this cordless impact wrench is most comparable to the Dewalt DCF899P2 and is another great option if you need an impact wrench with a lot of force. This is the only model featured that has a built-in protection mechanism which ensures that the unit will not overload or overcharge, giving it an edge over some of the other cordless impact wrenches. At 6.5 inches long, the Milwaukee 2763-22 is more portable than some of the other cordless impact wrenches on the market due to it’s smaller size and shape. With the two speed options, this model allows the user to pick the speed that best suits their needs, but not to the extent of the Hitachi WR18DBDL2. However, The Milwaukee 2763-22 more than makes up for that with its added power! The only downside to this wrench is that it does not have an in-unit battery indicator, which can lead to some inconvenience with determining if the battery needs to be charged. But when push comes to shove, this Milwaukee 2763-22 may be the runner-up for best cordless impact wrench for automotive use if you’re looking for serious power! All cordless impact wrenches function in the same way, and no matter which one you choose it is without a doubt safer than securing lug nuts on a wheel by hand! However, if you perform a side by side comparison, you’ll experience the many differences that each model has from the other. One of the first things that you should do before buying a cordless impact wrench is to decide on the brand that you want to get. Most people opt to go with a brand that they have other tools from. Doing this allows you to utilize the same battery pack and charger! After figuring out which brand you want to go with, you should take a second to asses and think about which environments you work in the most. There are two different styles of cordless impact wrenches – inline and pistol-grip! If you do most of your work in tight spaces, which is often the case with those doing automotive jobs, you should choose an inline wrench as they work best for small spaces! However, if constricted areas aren’t necessarily an issue for you a pistol-grip wrench is much more comfortable to handle and allows for more extended periods of use without fatigue. If you want your impact to be durable and last you a long time you should go for a model that features a brushless motor. Cordless impact wrenches that have brushless motors have less moving parts – which means that there’s less to break! In the event that something does go wrong, wrenches featuring these motors are easier to repair. A cordless impact wrench is a wrench that operates off of battery power. It does what other wrenches do, but with added torque, and with minimal hassle (no dealing with cords)! These wrenches can be used for tasks that would be dangerous to complete with a non-electric wrench like removing tires. Will a cordless impact wrench remove lug nuts? As long as your wrench has a torque of at least 100 ft-lb, then yes! When it comes to a cordless impact wrench for lug nuts, you will be good to go by choosing any of the wrenches listed in the article. What does it mean if the wrench that I choose has speed options? If you have chosen a wrench with speed options, the different speed controls will affect the amount of torque being utilized by the wrench! Having a cordless impact wrench with speed options allows for greater control over the amount of power that you are using. How powerful is my cordless impact wrench? Wrenches that have a higher maximum torque will be more powerful than those with a lower torque rating. If you’re dealing with larger vehicles and looking for a powerful cordless impact wrench opt for one that offers at least 600 ft-lb of torque. If I have an impact driver, do I still need an impact wrench? The short answer is yes! There is a lot of similarity in the way that impact drivers and impact wrenches function. However, impact wrenches provide much more torque than impact drivers. Impact drivers are primarily used for screws and small bolts. When working with larger bolts, like those found on cars, you need the power of an impact wrench to do the job! There are many reasons to add a cordless impact wrench to your inventory, and as you know by now, it is important to be sure that you are taking the many differences and varying features into account before making a decision. In addition to the advice offered in the buyer’s guide and FAQ, there are a few more things to keep in mind to make sure you are getting the correct cordless impact wrench to suit your needs. Before purchasing a new wrench be sure to take stock of the different types of vehicles that you work on the most. To get the most value out of your investment, it is essential to get a cordless impact wrench that offers the amount of torque that you need to get the job done. If you’re working on small vehicles, you likely do not need a wrench that offers 700 ft-lb of torque! Using too much torque on a bolt can be dangerous! It can cause the bolt to break in half. If you over tighten the lug nuts on a vehicle, they can break and fall of which could lead to serious harm to the person driving the vehicle. On the other hand, if you’re working with larger vehicles that have larger bolts, it is important to invest in an impact wrench that can apply more torque. Otherwise, you have to deal with the risk of the bolt falling out, which is just as dangerous as the bolt breaking. By keeping these things in mind, you are ensuring that you are making a safe purchase, and that you are spending your money on the right wrench for the kind of vehicles that you are working on!